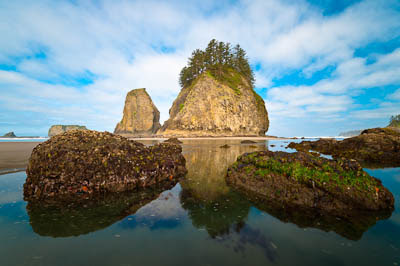 With the moon nearly full, morning promised a low tide at La Push. Mornings are not my prime time, but determined to get on the beach with high pressure building in, there was hope of good light. Second Beach is very shallow, so when the tide is low, it recedes a fair distance from shore. This photo was somewhat inspired by the rocks in the Portland Japanese Gardens, with the small rocks "facing" the main monolith. The sun was coming out between the receding clouds, so I waited until the rocks were in the shade and the large stack was lit up, to give depth and interest while having the sun at my back. 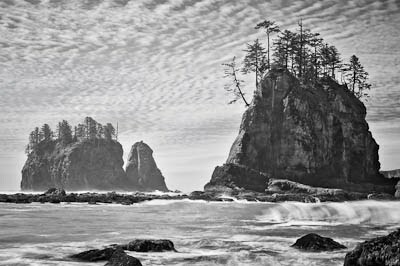 After shooting the morning light, I have been concentrating on late morning and later afternoon shooting, the goal is to use longer exposures, and processing with black and white or monotone images.